If your dog loves to play, we recommend that you sign them up for this awesome social shindig. 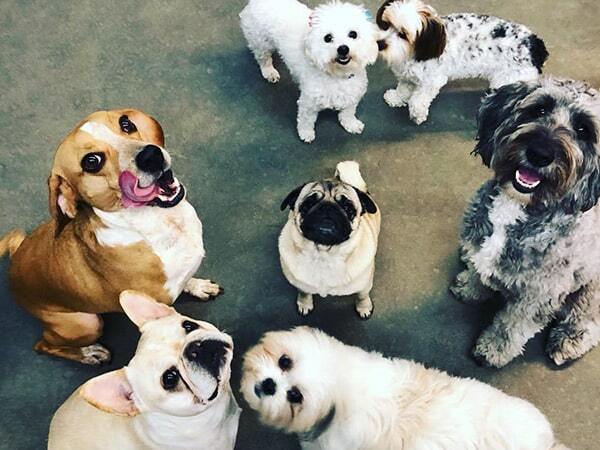 ​Our doggie daycare service here in Baton Rouge is recommended for the active, energetic dog who craves affection and the companionship of others on busy days when you are not able to give them the attention they deserve. In addition, all pet parents get free access to live streaming cameras in our daycare so you can keep an eye on your furry friend. All pets must be leashed, in carrier, or carried upon entry. All daycare pets must be friendly with other pets and must be spayed/neutered (no exceptions). We require the Bordetella vaccination every 6 months if your pet is staying for daycare or boarding. Un-Neutered or Un-spayed puppies may participate in daycare as long as they are up to date on Rabies, Bordetella and Distemper. Once they reach the 6 months of age mark we ask that they get spayed or neutered in order to continue to participate in daycare. If you would like your pet to be fed during daycare you must provide your own food (unless your pet is boarding as well). Daycare is provided M-F 7:30am – 6:00pm Sat 8:00am – 4:00pm. Daycare dogs will be kenneled at 5:30pm for cleaning. You can drop-off and pick-up your dog anytime during our hours. We offer off-leash daycare which includes playtime with staff and friends.